Chile: the final frontier. These are the voyages of fearless wine-makers. Their mission: to explore strange new terroirs, to seek out new grapes and new techniques, to boldly go where no phylloxera has gone before. Chilean winemakers might not go as far as the starship Enterprise, but some are opening their hearts to the adventure and are leaving the comfort zone that have made Chile a safe bet for mainstream, average and forgettable wines. Chile is unique in many ways. Its fortress-like natural borders make it the safest place to be if zombies attack and they are also to thank for the health of Chilean vines: Impenetrable mountains Cordillera de Los Andes on the East, the planet’s driest desert, Atacama, to the North, frozen wild land Patagonia down South and the vast Pacific Ocean to the West. These same barriers were the ones that protected the country over a century ago when a real pandemic ravaged the world’s grapes: the phylloxera virus. As the night of the living dead for Vitis vinisfera fell upon late 19th century European vineyards, grapes planted a long time ago on this continent far, far away were alive and well. Chile, which had known the fruit since colonial times, was by then an independent nation and realised that wine was a new hope, but in order for it to be a successful export, quality was going to be essential. As Old World winemakers fled to South America, Chile welcomed their know-how and their flagship grapes. Decades of learning and perfecting, along with enviable business vision made Chilean wine ubiquitous in off licenses everywhere and by the 80s, the pendulum of priority had swung to quantity. Inexpensive, easy to drink and fruity bottles that disappeared from the shelves as quickly as from our palates and memories were the norm. But as consumers grew wary of petrol station Merlot chileno, the same savvy vision made Chilean winemakers realise that it was time for that pendulum to swing again. After all, Chile has many elements to chose from for anyone who wants to give added value to wine: pre-phylloxera grape clones, grapes planted on their own rootstocks (unlike most European vines which require American phylloxera resistant ones to avoid disease), old vineyards, a virtually pest-free land that almost begs for organic agriculture and valleys with so much soil and climate diversity that compel to experiment and innovate. Did we mention that it’s excellent value? You can get fine Chilean wine for way less than many Old World bottles on a similar level. Separating the science from the fiction in Chilean wines is not that hard but a couple of tips will help you make better choices. Let’s start with the use of the word “Reserva”, which in Spain means that a red wine was kept for three years in the cellar and at least one ageing inside a barrel while a white or a rosé stayed in for 2 years (at least 6 months in barrel). In Chile that same word only means that the wine is considered top quality by its maker, perhaps because they used their best grapes or because they came from a more valued terroir, but there is no obligation regarding ageing or barrel time so if you’re looking for oak you might want to do a quick online search before grabbing a bottle. Second, valleys matter. As in other wine regions, the broader the appellation the less character a wine can express. The very common Valle Central (Central Valley) encompasses many smaller valleys and if you’re looking for a terroir driven wine you might want to keep it specific. Maipo and Colchagua are two of the highest regarded sub-regions and it is an upgrade worth paying for. But valleys aren’t everything. With Chile being so narrow but so long, there is an important difference between a wine depending on what part of the valley it comes from: the coastal west, the more continental middle or the cool temperature east (courtesy of the Andes mountains). 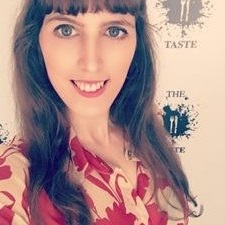 Regarding what to choose, going coastal and middle-of-valley for Bordeaux style wines and cool climate for Pinot Noirs makes sense. Ready for a small sip of Chile, a giant leap in quality? Emilio Bouchon arrived from St. Emilion, Bordeaux, to Chile in 1892 and since then, five generations have kept alive his pioneering spirit. Mario Pablo Silva, the current member of the family in charge of the winery, realised nearly twenty years ago that quality was the way to go and today Casa Silva has become Chile’s most awarded winery of the 21st century. Their wines are sustainably produced and although most of it comes from the Colchagua Valley, they also have some of the Southernmost vineyards near Patagonia. After trying part of their range at a guided tasting in One Pico Restaurant recently, we decanted their Cool Coast Pinot Noir, made in the region of Paredones within the Colchagua Valley. A dark cerise-red colour, a refined and delicate mix of fresh raspberries and cherries with a foresty background. Silky and with a pleasant finish, it showed only a bit of oak to keep things spicy. Gentle enough to serve with fish or grilled vegetable dishes. 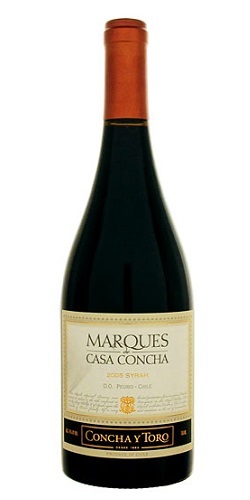 Chilean oenologist Marcelo Papa has been responsible for Marques de Casa Concha since 1999. We had the opportunity to taste his Syrah along some other wines from Concha y Toro paired with dishes from chef Derry Clarke at L’Ecrivain a few weeks ago and it was – along with the Cabernet Sauvignon – one of the evening’s favourites. It was decanted for a short while and we’d suggest to do the same when enjoying it (an hour or two will do). As its name hints, it’s closer in style to an old world Syrah than an Aussie spice attack of Shiraz. Made from handpicked grapes and aged for two years in French oak barrels (only 20% new), its deep garnet tones said ‘I’m strong‘ but its sweet blend of blackcurrant and baking spices whispered ‘I’m kind‘. A time-traveler wine that will be just as lovely today as in 2020. 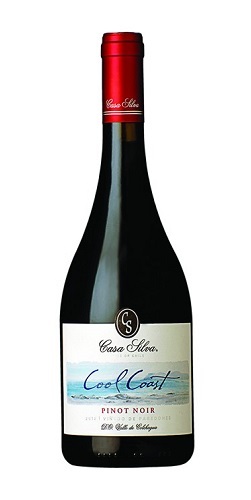 14.5% ABV – Cabernet Sauvignon, Carmenère, Merlot, Petit Verdot, Syrah, Mourvedre. This one is a bit of a cult wine and a must-try if you believe in (or at least if you enjoy) biodynamic wines. Even if you don’t, it might convince you. Coming from Emiliana Organic Vineyards – Wines of Chile’s Vineyard of the Year 2015 – and with a name that means oak in the ancient Mapuche language, its carefully selected grapes from the Maipo Valley blend in a wine that shows a beautiful balance between richness and elegance. It shows dark red colour with violet gleams and a combination of nutty and toasted notes as well as ripe red and black fruits. 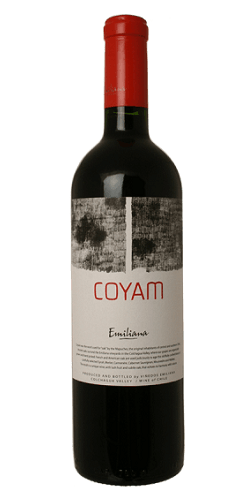 Aged for 13 months in a mix of of American (20%) and French (80%), Coyam also gives warm spices like cinnamon and vanilla as well as roasted coffee and tobacco aromas.